In 1996 we moved to the Crete Senesi and we fell in love with this farmhouse Etruscan origins, medieval mill, peace and tranquility. That’s why we decided to share it with our guests and their four-legged friends. The farm keeps the whole family busy: Alessandro (biologist, nature guide and Sommelier), Elisa who looks after the administration, Mauro and Paola, retired but full time busy on the farm. And we hope that in the future even Emma and Guido will give us a helping hand. We produce vegetables and fruit, olive oil and truffles from organic agriculture. For our guests we organize a rich programe of initiatives discovering the colours and flavors of the Crete, wine tasting in our cozy winery and excursions by bike guided by Alessandro who is fond of cycling. In Asciano you cannot miss the Monte Oliveto Maggiore Abbey, the Palazzo Corboli Museum and a drive tour through one of the most photographed landscape of the world, the crete senesi. On day you have to relax and the Spas in Rapolano Terme. It is very easy to reach Montepulciano, Pienza, Montalcino, teh orcia Valley, the Chianti, Cortona, Orvieto, lake Trasimeno. 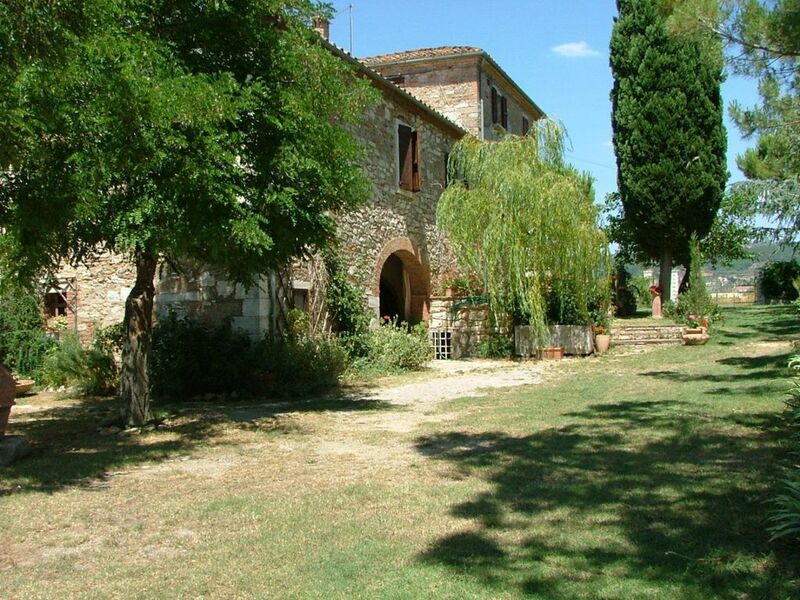 Serre di Rapolano at 2 km, Rapolano Terme with all kind of shops at 5 km, Siena at 25 km. Only 4 km from our farm there are the thermal baths of Rapolano which grant special discounts to our guests. Swimming pool with deck chairs and sun beds: 6mx12m deep from 1,20m to 1,50 m.
Baby bed available free of charge. Washing machine shared by all the apartments, in a laundry room. Children playground with slips, trampoline, swings, swinging horse. Breakfast ( to be booked at the reservation and not available in July and August). with homemade cakes and bread, local cheese, fruit juices, fresh fruit, yogurt. Apartment on first floor of 60 m2. It is composed of: a double bedroom; a large living room with sofà; a kitchenette (cooking area with 4 fires, small oven, fridge, electric kettle) and television and of a bathroom with shower. Outdoor area with table and chairs in the garden, shared with the renters of Il Cipresso apt.